Baths can be made from a variety of materials. Enamelled steel and iron baths are cold to be touch. Steel baths are cheaper but chip easily, iron baths are expensive and heavy, but are long-lasting. Acrylic are light, cheap, and warm but can be scratched, and thin acrylic can be deformed by heavy loads of water. Composite resins are sturdy, but lighter than metal and warm to be touch. Other options include baths with water jets and air bubbles. Walk-in baths are also available with improved access for the elderly and disabled. A shower can be fitted over the baths, but there are situations when they can’t. Bath dimensions cary widely, so first we will check a new bath if will fit in the same spot as the old. Another consideration with very large baths is whether is possible to manoeuvre it through your home to the bathroom. Room to work is also very important – especially in smaller bathrooms. It will be necessary to remove the other fittings in order to remove the old bath and fit new one. There is an enormous selection of shower designs on offer. To add a new shower to your existing suite, one option is to construct a separate cubicle for one if there is room. Alternatively, we can install a shower above the existing bath. In some cases your main bathroom suite will come with a matching shower tray and cubicle as an optional extra. If you are not buying a new suite, then separate cubicles, trays and screens are readily available. These are designed to fit particular sizes and shapes of shower tray. The structure of a shower cubicle usually relies on tiled area of the bathroom walls making up one or more of its sides. We use cement boards or Gyproc moisture resistant plasterboard on the walls that will be tiled inside a cubicle. Some manufacturers make all-in-one cubicles with a built-in shower. Alternatively, a walk-in shower can be created. Walk-in showers are a type of shower enclosures that fits into large bathrooms. A “drying area” separates the entrance and the shower, making a door curtain unnecessary. The walk-in shower it is fitted in the same way to a standard tray and cubicle. When fitting one, we are using plasterboard and cement boards for the internal walls of the shower. This provides the best possible surface for tiling and gives a fully waterproof finish (glass wall can be build too, instead of the ordinary stud walls). Acrylic, resin and ceramic shower trays are available. We usually install solid resin and ceramic trays on a bed of mortar, by doing this, a section of the flooring will be removed to accommodate the trap under the solid tray. But sometimes it is impossible, and when it is we build the tray up on a plinth or install an acrylic shower tray instead. Acrylic trays usually have adjustable legs and side panels, similar to a bath. They sit higher off the floor than solid trays, which means waste connection is easy, and removing sections of the floor is rarely necessary. There are several different of shower and it is critical that you choose one for your plumbing system. If you tank-feed hot water storage cylinder or a combination boiler we can fit a mixer shower for you. If you don’t have a cylinder, or if it does not store enough water, then you might go for an electrical shower. The power of both mixer and electrical showers can be boosted with a pump, but only if they are fed from a water storage tank. These use a mixer valve to combine hot and cold water to the temperature required. Mixers need hot water to be red from a storage cylinder or a combination boiler. 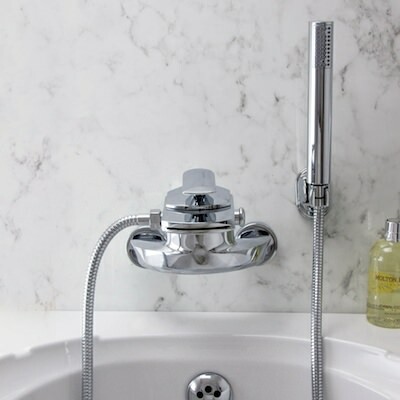 Thermostatic mixer showers have a more sophisticated valve that remains set at the required temperature when you turn the water on and off, and prevents temperature fluctuation. Many thermostatic mixer showers have an automatic shut off if hot or cold supplies fail, and on some models you can set a maximum temperature. These are fed from the cold-water supply – either from a tank or from mains. The water is heated to the temperature required within the wall-mounted unit of the shower. Flow is dependent on mains pressure and on the power of the shower installed – more power will heat water quickly and allow it to pass through the system faster. A pump can only be fit your shower is fed from a tank. Pumped showers are known as “power showers”. Most tanks are large enough to feed one pump, but in households with more than one pumped shower, a larger or second cistern may be required. When we fit a pump, the installation requires a connection to the electrical supply, which we make it via a double-pole isolating switch.